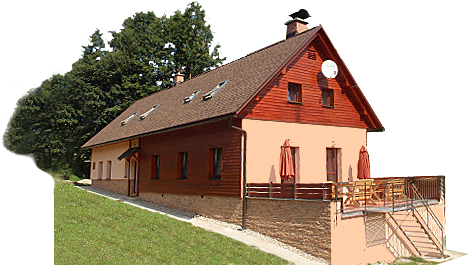 Heating in the lodge is provided by means of a heat pump as well as central heating. For internet use we supply free wifi available throughout the lodge. Food brought by you can be stored in a cool underground cellar. Under a teracce you can find a bicycle storage area where the wood is also stored. This room can be locked if necessary. A garbage from the cottage passes through a waste treatment plant. For our guests we also offer a sauna on the first floor. - Free parking space is supplied for 3 cars belonging to guest. - Outdoor fire place and barbecue which runs on charcoal. - For children seesaws and play area. From an entrance hall you can enter: a ski storage, a WC, a technical room, a private owner´s flat and a lounge. In the ski storage you can find an electrical shoe dryer and ski holders. On the ground floor is a lounge equipped with LCD satellite TV, DVD and CD player, basic selection of DVDs, CDs, books and games. In the ground floor you can find a lounge equipped with a LCD TV, a satellite, a DVD and CD player, basic menu of DVDs and CDs, books and games. Within this lounge there are also 2 sofas and big dinning table which seats 12 people. For a more comfortable atmosphere you can use a tile stove. Our guests can also use the provided bar. Upon request we can also arrange a barrel of local beer for customer´s use. In the lodge you can also use the fully equipped kitchen, fridge, dishwasher, microwave, as well as an oven, preparation bench, two kettles and pots and pans. The first floor is dividend into 4rooms. 1 room with a double bed, 1 room with 2 single beds, 1 room with 3 single beds and the last room with 4 single beds. Each room has it´s own pillows and blankets, but linen is not provided. All rooms are equipped with toilet and shower. 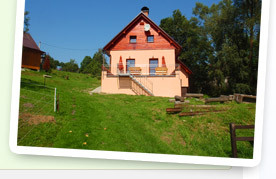 - The lodge is strictly a smoke free area and smokers are requested to only smoke outside the building. - Pets are not allowed to enter the premises. - Customers are requested to leave their shoes at the front door and use slippers inside the premises. - Customers are requested to bring their own bed linen. Please do not use sleeping bags.